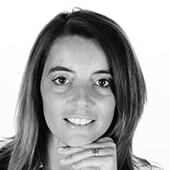 Alessandra Zamparini is Lecturer and Post-doctoral researcher at the Institute of Marketing and Communication Management (IMCA). She holds a PhD in Communication Sciences and Economics and Management from the Università della Svizzera italiana in co-tutoring with the Università degli Studi di Padova. She develops her research mainly on the topics of organizational identity and organizational communication. She is especially interested in the understanding of identity processes within local business communities, with a special focus on the creative industries (wine, festivals). Alessandra teaches Corporate Communication Research Methods at the MSc in Corporate Communication, and Organization at the Bachelor in Communication Sciences (2017/2018). She has teaching experience at the master and bachelor levels at Instituto de Empresa (IE) Madrid, and IULM University Milan, in the fields of organizational identity, strategic communication and research methods.